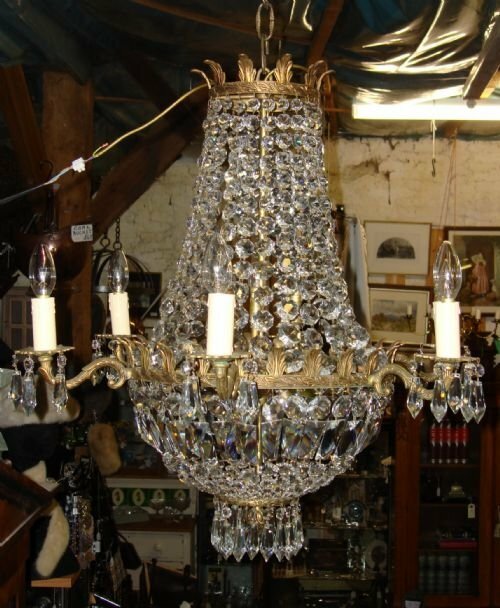 Early 20th century elegant large French gilt brass and crystal 12 light chandelier with interesting provenance. Early 20th century wonderful French large gilded cast brass chandelier in the Empire style with 12 lights and graduating waterfall garlands of crystals, forming a beautiful shape. This chandelier has 6 interior lights (two tiers of three lights each) and 6 exterior lights mounted on cast scrolled leafy branches. The bands at the top and middle feature raised acanthus leaves, a lovely accent. Size-approx. 27.5 inches high (measured to top band of chandelier) by 27.5 inches wide. Height measurement doesn't include any chain or the ceiling rose. Approximately 20 inches of chain is also included. This came from the estate of Sylvaine le Desert, who was the daughter of the famed Paris journalist Jacques le Desert, and the granddaughter of Alexandre Israel, newspaper proprietor and minister. Ms. le Desert survived occupied France posing as a village girl, working the land, and joined the French resistance. She moved from Paris to Surrey where she lived for many years until her death in 2009. 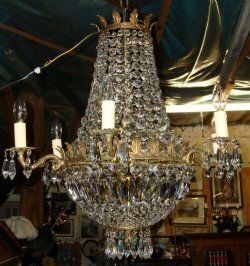 With a lovely history attached, this is a fabulous chandelier to hang over a dining table, or in an important room of a home. 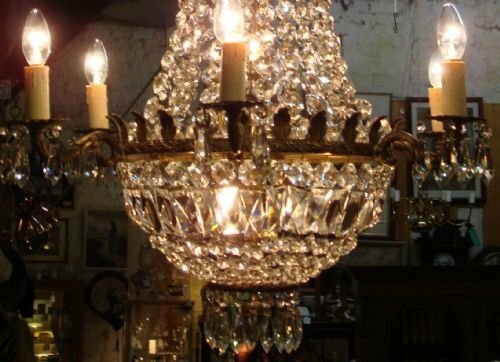 In very good condition, this very elegant chandelier has been fully rewired to modern UK standards. 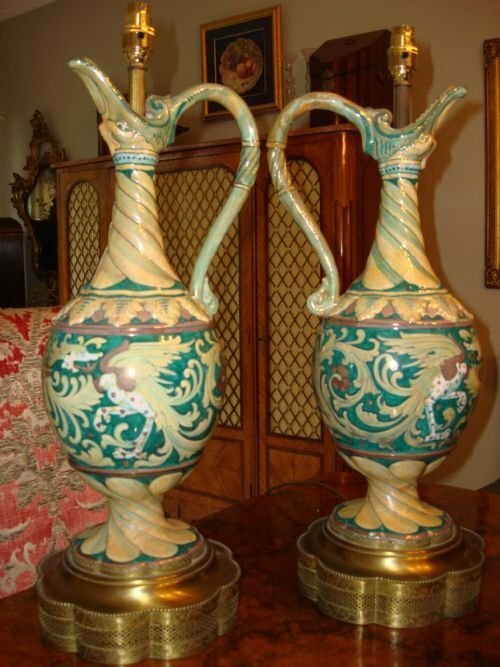 Stunning pair of tall 19th century hand painted ceramic lamps in an unusual design. Very striking pair of antique tall hand painted ceramic lamps in the shape of ewers featuring a design of mythical winged beasts. They were likely of Continental origin originally. The bulbous design of the central body features two winged beasts meeting, while the spout features the head of a beast, if one looks closely. In addition there are wonderful spiral designs to neck and base, and a leafy band at the base of the neck. The long curving handle also features a spiral design. The colours are a muted and mottled selection to work with any decor, and the whole is covered with a lustre glaze. 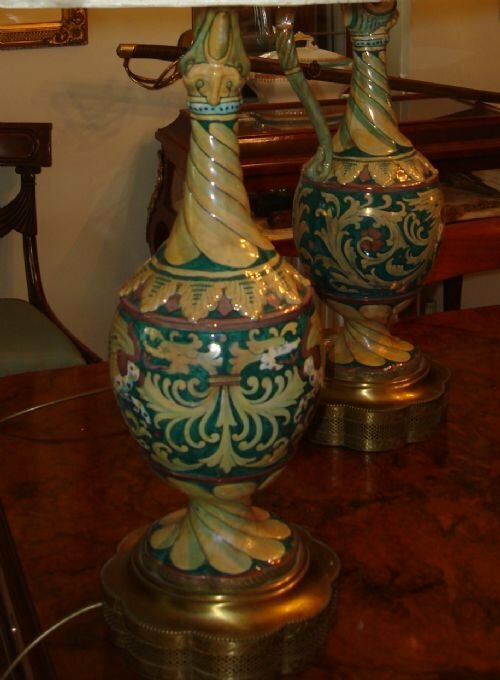 The pair stands on pierced brass bases made in an octagonal lobed design, to echo the shape of the ceramic base. They are covered with baize underneath to protect the table. A lovely pair of shades in a lined silk fabric are included. The lamps have been completely rewired to modern UK standards, and come with cords approximately 8.5 feet long to be able to reach most service points conveniently. Size-34 inches tall overall with shade. Width 8.5 inches at widest point (handle to spout), with an 8 inch diameter base. Shade 18 inches diameter by 12 inches deep. 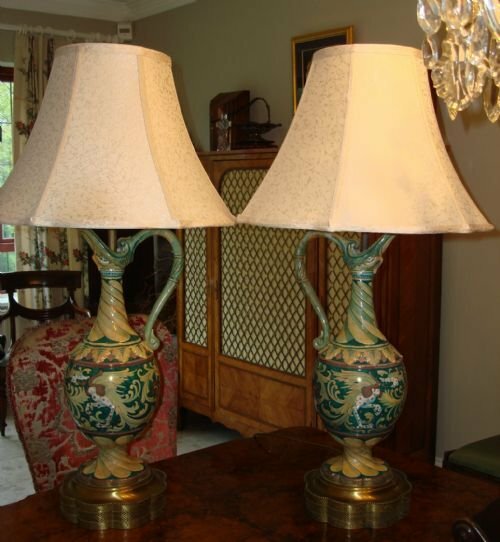 A really lovely and unusual pair of beautifully hand painted lamps in very good condition, which create a lovely warm glow in the room when lit. Such nice lamps are difficult to find. 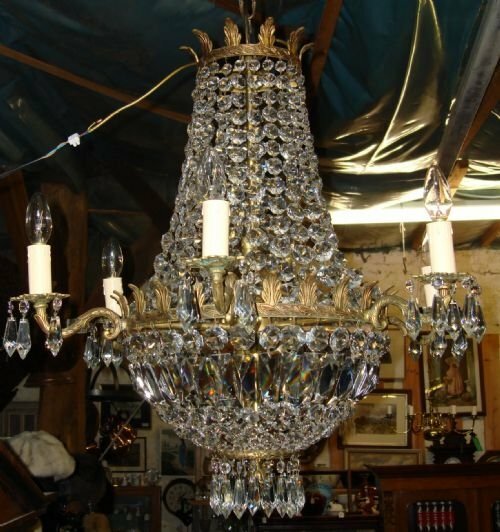 From the first half of the 20th century, a lovely gilt iron, glass, and cut glass chandelier completely professionally rewired to modern UK standards.The six branches, with tall glass candle holder covers are complemented by the lovely flatback and prism cut lustres. Size is approximately 20 inches wide by 22 inches high. 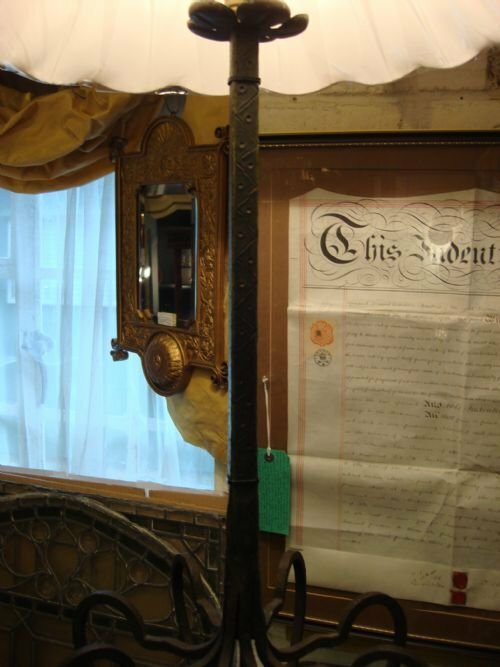 A lovely very good quality classic chandelier including 6 black shades, in very good condition, all ready to hang. 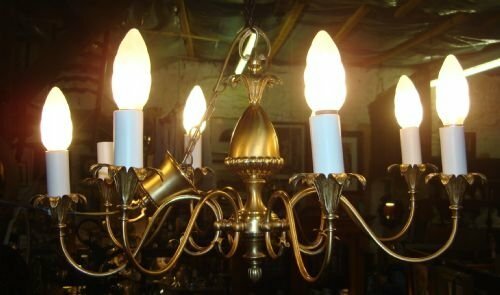 19thC Victorian unusual two branch brass chandelier with vaseline glass shades. 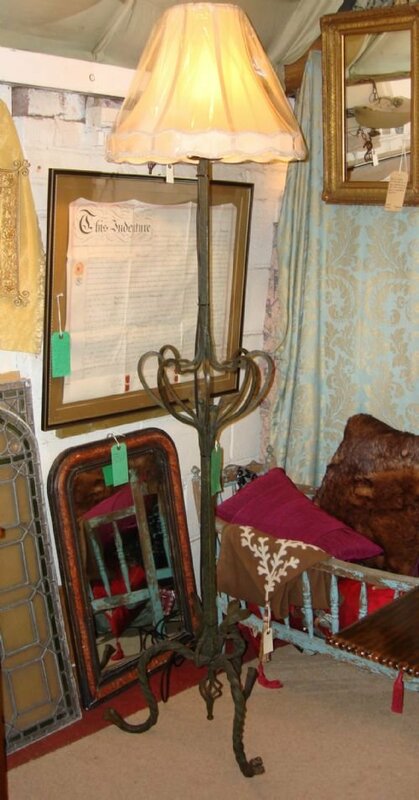 19th century lovely and unusual Victorian brass chandelier having two branches and swirled vaseline glass shades. All tubular sections are very attractively embossed with a leaf design, while the branches also have open scroll and leafy pierced detailing. The shades have a lovely colour and a beautiful swirled design. The whole hangs on a chain and ring suspension. Newly rewired to modern British standards. Size-25.5 inches wide at widest point by 24 inches high (not including chain). 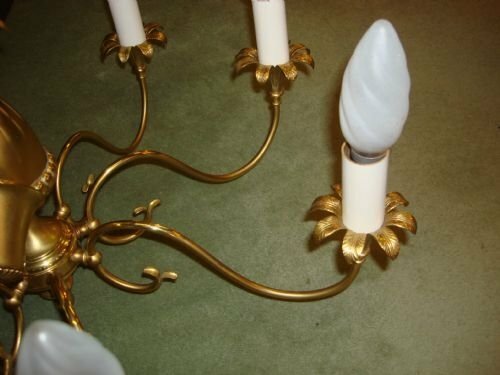 An unusual and elegant design, in very good condition, to light any room. 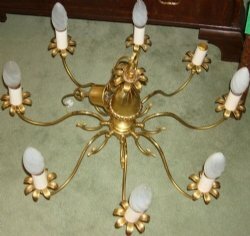 Circa 1940 stylish large gilt metal 8 branch chandelier with pineapple decoration. 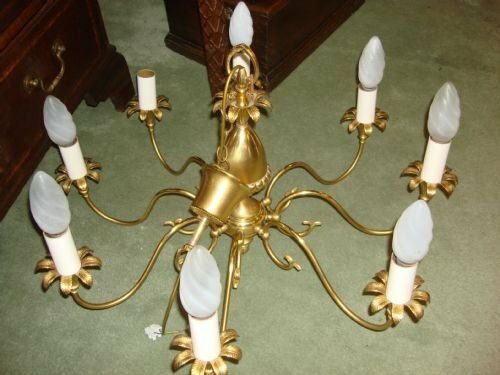 Circa 1940 classic and stylish large gilt metal 8 branch chandelier with pineapple form central column and pineapple leaf decoration to the lamp bases. Pineapples are the international symbols of welcome. Includes lovely ceiling canopy and chain. Newly rewired to modern standards. Size-27 inches diameter by 17 inches high to top of column (does not include length of chain or ceiling canopy). 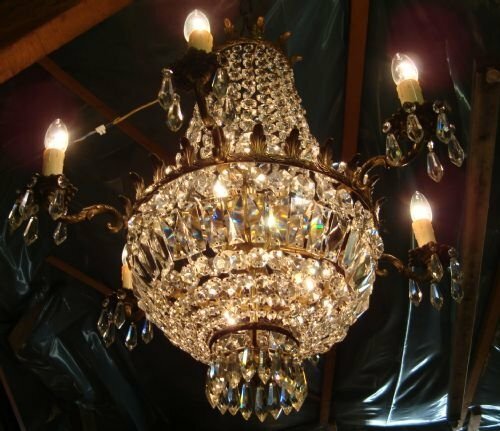 A very elegant chandelier in very good condition, to use in any room. Early 20th century two tier brass and cut glass lustre bag chandelier. 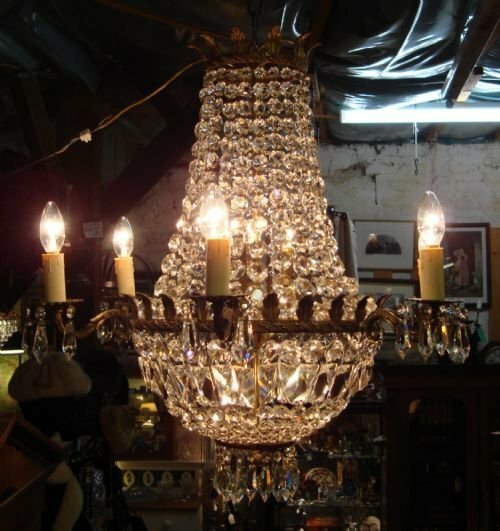 Early 20th century two tier brass and cut glass bag chandelier with original beautifully cut glass lustres. It has been newly rewired to modern European standards. Size-15 inches long by 8 inches wide. Hanging chain is 42 inches long, allowing it to be cut and hung at whatever length preferred, or from a high ceiling. An unusual bag chandelier In very good condition. 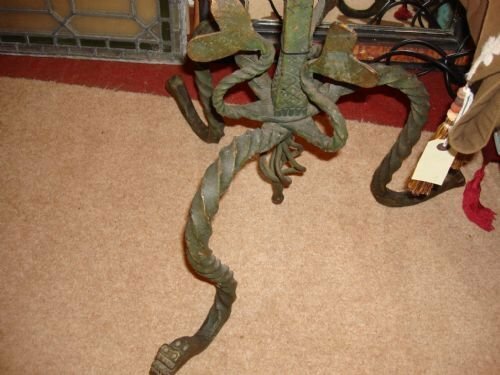 Victorian verdigris and bronzed cast iron Art Nouveau period standard lamp with heart detail. 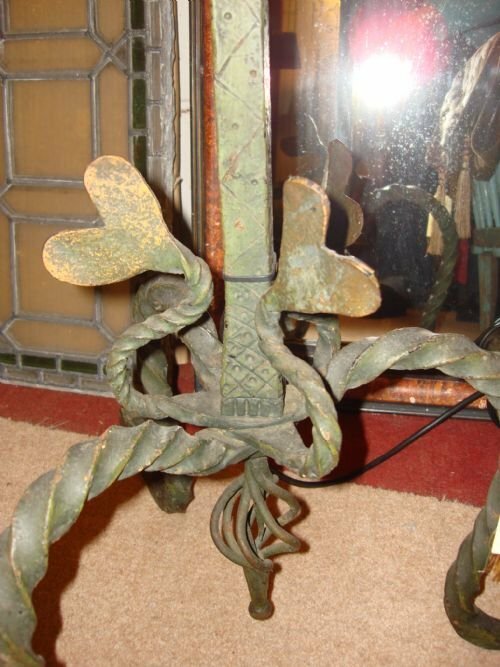 Victorian Art Nouveau period unusual and stylish heavy cast iron standard lamp with a verdigris and bronzed scroll and heart decorated design, very Nouveau. 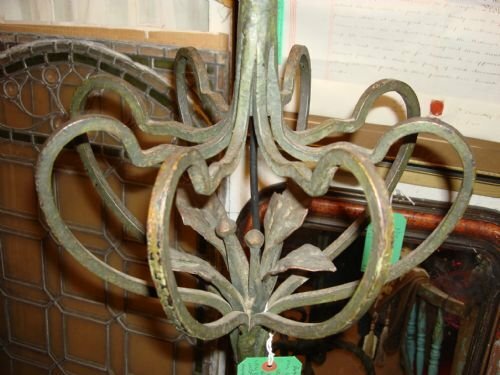 The top near the bulb holder forms a flower petal, extending to a leafy and heart scrolled middle section continuing down a patterned stem and terminates on spread twisted feet with some heart detail above, and a twisted pendulum below. Includes new neutral coloured complementary lamp shade. Size-74 inches high to top of shade, or 62 inches high to bulb holder. 13 inches wide middle section, and 22 inches wide at base. This has been rewired to modern UK standards, and would make a very stylish statement for any room. 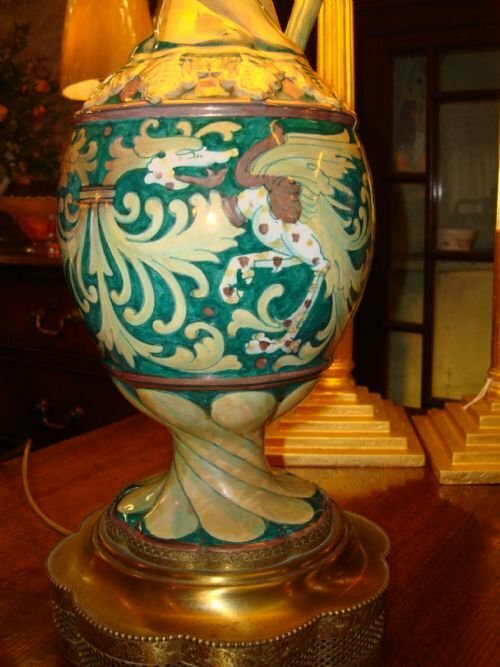 19th century Kutani porcelain vase professionally converted to lamp and wired to modern UK specifications. Includes new pleated black silk shade. Late 19th century pair of cut glass lustre lamps rewired to modern UK standards, and with new shades. Size 15.5 inches tall to top of shade x 6 inches wide with shade, or 4 inches wide without. 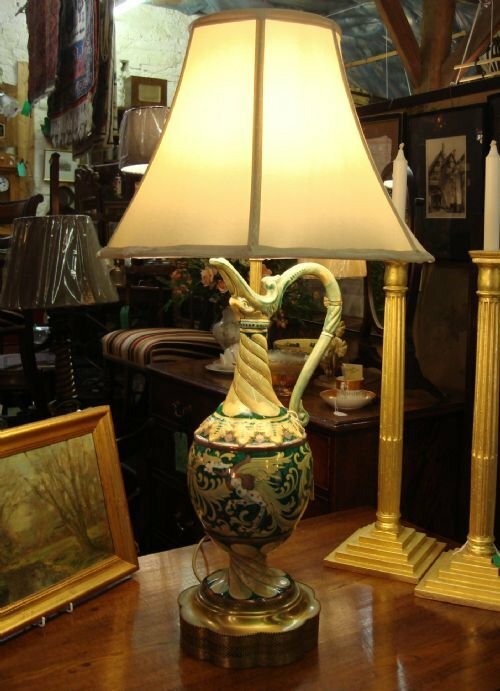 Lovely pair of lamps in excellent condition. 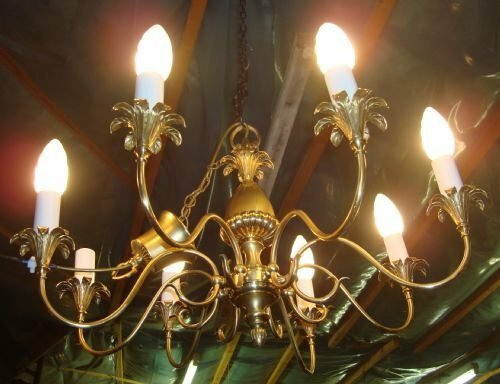 20th century classic and stylish brass chandelier in the 18th century style. 20th century very classic and stylish 6 branch brass chandelier having octagonal cups to candle bases and top of column, panelled vase shaped centre, and leafy detail to branches. 6 black pleated shades are included. Size-22 inches wide by 18 inches high to ring (not including chain). Wired to modern British standards. A lovely chandelier and a great value. In very good condition, and functional for any room.